You got a new TV and you’re not satisfied with the sound it delivers? Don’t worry. It can be easily fixed even with the simplest soundbar. In this article, we will present to you 13 best models of soundbars under $200 that will be useful in any house. We chose them based on their characteristics and value that you get for the money. None of them costs more than $200. We have decided to make this selection because most of the customers decide to buy soundbars that are not too expensive. That’s completely fine as the technology is developing rapidly and today you can find excellent products for small amounts of money. Some of the products on our list are very cheap, while the others cost more but all of them offer a lot for the money. When you define your budget, you can check out our list and we are sure you will find something interesting that is suitable for you and your home. We will also try to describe what soundbars are, how they work and what exactly you can expect from them. We will also emphasize all their advantages and disadvantages in order to make it easier for you to pick the best possible product for yourself within the limits of your budget. Soundbars are the cheap and simple replacement for the complex and expensive surround sound systems. It is some kind of all-in-one speaker/speaker system that improves usually poor sound quality of your TV’s speakers. Soundbars can be different (they may consist of one, two or more parts, they can be thin or wide) and have different length, from one to 5 feet and you choose which one to buy depending on the dimensions of your TV, the type of the soundbar or its position in your house/apartment. Two main types of soundbars are soundbars and sound bases (pedestal soundbars). Sound bases or commonly known as pedestal soundbars are more traditional soundbars that are no longer so popular. They are called pedestals for a reason. Sound bases are wider than regular soundbars and they are used as pedestals for TVs. They are probably simple for using because their only position can be under TV and they can’t possibly block the signal from your TV’s remote. The sound bases still can be bought but they have become quite rare due to the changes made in TV design (pillar design, to be correct). The pillars are not centralized anymore but moved to the ends of the screen because that is safer and makes the TV more stable. However, the TVs with centralized pillars can still be bought and those are usually smaller TVs that can fit on the sound base. You just have to be aware of one potential disadvantage – sound bases don’t have subwoofers and they can’t deliver the same kind of sound as soundbars can. Soundbars are bar-shaped speakers. They are long and thin and they come in different combinations (with or without subwoofers that are there to add some deep bass, which is very important for watching films and listening to electronic or hip-hop music), they can be Bluetooth or wireless, self-powered or not. Most of the modern soundbars come with subwoofers, they are Bluetooth enabled and usually self-powered. Soundbars can be placed in front of the TV (where they can block the signal from TV’s remote) or you can mount them to the wall below your TV as they usually come with wall brackets. Although they might seem strange to some people, soundbars are actually very simple and they won’t cause more problems than regular speakers but they will perform way better and even offer some kind of replacement for surround sound. They usually come with wall mounts and the cable that is inserted into a wall socket. If the subwoofer is included, it also has its own power adaptor but it is almost always wirelessly connected to the main part – the bar. The subwoofers receive audio signal via Wi-Fi from the bar. It can be placed anywhere as bass is in the group of low-frequency tones and human ear can’t really locate the direction where those tones are coming from. You can choose between stereo or surround sound soundbars. Most of them are stereo bars, which means they mimic the way that the left and the right speaker on your TV deliver sound. However, soundbar has larger speakers and the sound is more powerful. Also, you can get special soundbar with 2 or 3 speakers (one on the right side, the other on the left and the third in the middle) that produce better sound than classic stereo soundbars. There are also soundbars with several channels/speakers that can create three-dimensional sound and make the impression of a small home theater. Once you have chosen the soundbar, it is important to connect it to your TV. One way (and the most common) is to connect cable or satellite box to the TV, TV to the soundbar via digital optic port or HDMI and the TV will send the sound to the soundbar. The next important thing is the position of the soundbar. As we have said before, it is not so important where you will put the subwoofer (in case you have one), but it is important where the soundbar will be. It is important because if you put it in front of the TV, it is possible that it will block the signal of TV’s remote and that can be very annoying. Also, pay attention to the remote controller. Most of the soundbars come with their own remote, but you have the possibility to adjust the settings so that the soundbar reacts to the commands you give using TV’s remote. You can also program TV’s remote to control the soundbar, or even use your phone as one. If you’re looking for a small soundbar that delivers powerful, extremely clear and crisp sound, Zvox AccuVoice AV200 is the right choice for you. Its dimensions are 17×3.1×2.9 inches, it can fit almost any room, it is very easy to connect and it is perfect for people with hearing problems because it makes human voice more distinguishable. AV200 is connected to TV via digital optical cable; it has its own remote and front panel display. The total output power of this soundbar is 24W. AV200 comes with one-page user manual, AS power adapter, 2 AAA batteries, remote control, 5’ stereo minijack cable, 6’ digital optical cable and 58’ RCA cable. Zvox AccuVoice AV200 has very simple design. It is quite small but it has 3 speakers and its build quality really amazes us. The soundbar is made from aluminum and steel while the ends are nicely rubberized with rounded edges. On the side, you will see power on/off button and volume controls, while the display is located on the front side. On the display, you can see volume level, bass, treble and other settings, just like you can see if output leveling, mute and AccuVoice features are on or off. The soundbar can work as regular soundbar or you can turn on some of the available modes. OL (output leveling) feature is there to prevent the commercials to be louder than the rest of the program, while ACCU (AccuVoice) feature is used by people with hearing aids, hearing problems or people who simply can’t understand all the dialogues on TV. ACCU separates voices from the rest of the sound and makes them louder, clearer, and more understandable for the previously mentioned customers. AV200 can be placed in front of the TV (it is so small that it can hardly interfere with the remote signal), on a shelf below TV or mounted to a wall. The setup is very easy as the soundbar is connected to TV via one digital optical cable. If you want to connect the soundbar to some other source, you have minijack port, but there is also minijack subwoofer port in case you need more bass. AV200 is one of the most expensive soundbars on our list of 13 best soundbars under $200. It doesn’t really perform so well for the price, at least not for people with normal hearing. If you have damaged hearing, this soundbar will be very useful, but if you don’t have those problems, it might sound very unnatural to you. OL won’t low down only the volume of commercials; it may low the volume down even when you don’t want it to do that (for example during the film, some sequences can be very quiet with no reason). In addition, the soundbar doesn’t have HDMI port. TaoTronics TT-SK15 is quite affordable 34-inch 2.0 channel soundbar that produces stereo sound thanks to its 4 speakers and 2 passive radiators that are responsible for the low frequencies (bass). It has dual controls (touch and remote) and it can be connected to your devices via Bluetooth, via digital optical cable, RCA cable. Total output power is 40W. The soundbar comes with its own remote control, its own power cord, RCA cable and user manual. 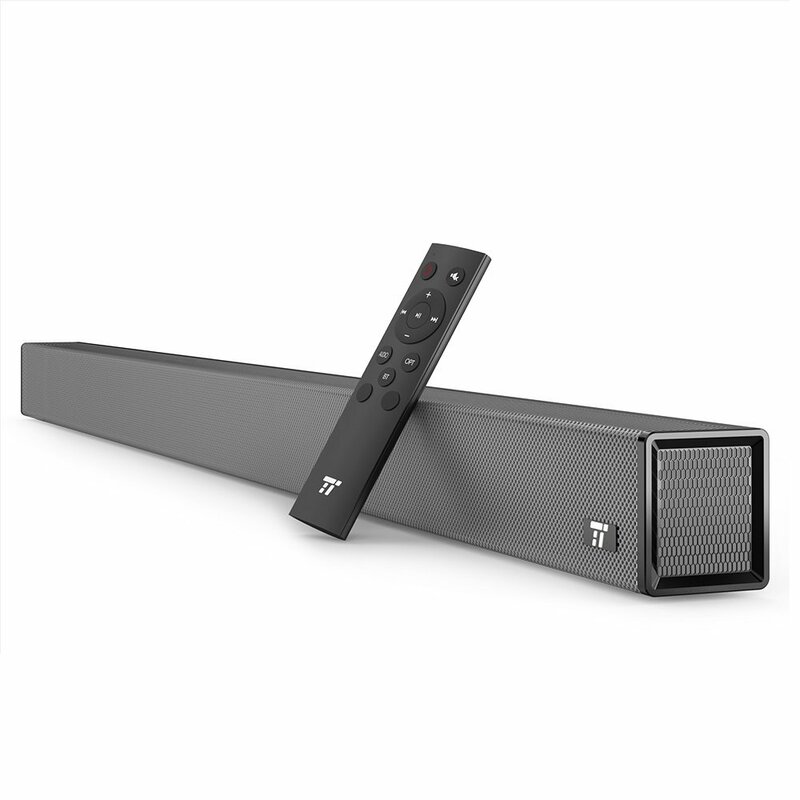 In our opinion, TT-SK15 is good-looking soundbar. It comes in black color, it is covered in some kind of fabric while the silver part in the middle is made from brushed steel and it contains all the touch controls with LED indicators. If you don’t want to use one more remote, you can use these controls as they are very responsive and easy to use. On the right side, you will find 3.5mm audio port, while all other ports are on the back side just like the protrusions for mounting the soundbar to the wall. One of the greatest things about TT-SK15 is its sound quality. The soundbar delivers great stereo sound and it can be quite loud. It is not audiophile-level sound quality, but the mids and the highs are very clear, distinctive and pleasant for listening. The biggest surprise is the bass. You wouldn’t expect so great bass from this kind of soundbar, but the passive radiators enable you to enjoy it. Also, all of the drivers are omnidirectional, which means they can send the sound in all directions. That way, your room will be filled with sound no matter where you put the soundbar. Of course, you can always set the soundbar to deliver the sound in only one direction, but then you will have to pay attention to the soundbar’s position. Although TT-SK15 offers the possibility to connect to your devices via Bluetooth, we wouldn’t recommend watching movies because the soundbar doesn’t have aptX low latency codec. Also, in case you have several Bluetooth enabled devices you want to connect to the soundbar, be prepared to spend some time dealing with it as you have to press the Bluetooth button for several second and wait while it is prepared to be paired again. And you have to do that every single time you’re switching between devices. In addition, the soundbar doesn’t deliver surround sound, so don’t expect anything better than great stereo sound. Avantree Torpedo Plus is small but powerful soundbar with very attractive price. Its dimensions are 1.9×10.8×2.3 inches and it weighs a bit more than 1 pound. The soundbar can be connected to the power source via USB cable, but you can also use audio 3.5mm cable or Bluetooth to listen or watch to audio or video content. The soundbar also has aptX low latency codec and it can be controlled by using the control buttons on the bar itself or by using the music player. Torpedo Plus is portable, it has the battery that can last for up to 7 hours on 60% volume and recharging takes 3-4 hours. The bar works in 3 modes and it has two 5W speakers plus the passive radiator in the middle. The soundbar comes with user manual, audio cable and USB charging cable. Torpedo Plus comes in black color. It has simple and interesting design and it can be easily fit in any type of smaller apartments. It is made from plastic that is nicely rubberized on the surface and the front side is covered with acoustic fabric. The impression is even better because of the matte finish. The soundbar has small anti-slip pads on the bottom and the set of buttons on the right side. On the front side, you will see LED indicator that shows you which mode is on (blue for 3D Surround, green for Super Bass and red for Balanced Audio modes), while the LED battery status indicator is on the back. There are also volume controls, mode control button, power button and USB port. The soundbar works nicely with phones players, laptops, computers, etc. but you can also connect it to your TV. In case you want, you can charge it and take with you anywhere you go. If you take care of the volume, the battery can last the amazing 12h. When it comes to sound quality, we were surprised by the power of so small soundbar. It is quite loud but the sound is crisp and clear. You can even get some decent bass (although only in Super Bass mode). The good thing is the bar has aptX low latency codec and you can use it to watch movies in Bluetooth mode, but that works only if you’re using the soundbar with the low latency receivers/transmitters. Considering the price, the size and the main purpose, we don’t have many complaints. However, we would like the bar to have its own remote, more options for connecting and at least small front display. Before you by this product, consider carefully its size and compare it to the size of your room and your TV. Take into consideration that the bar is small and it can’t completely fill big rooms with sound. Yamaha YAS-107BL is one of the most expensive soundbars on our list. It has all-black style, its dimensions are 35×5.12×2.12 inches and it has two woofers and two built-in subwoofers with the total power of 120W. In case you really love bass, the soundbar has separate subwoofer port so you can connect one subwoofer to this soundbar. It offers 3 ways of connection (via Bluetooth 4.2V, via digital optical cable and via HDMI cable) just like it offers 3 types of control (touch and remote controls and free Yamaha app). The soundbar comes in a simple box with power cord, USB adapter, its own remote, user manual, one optical cable. The soundbar has very attractive design in spite of its size. It seems quite durable and sturdy and on the front side you have touch controls that you can use to select the source, turn on/off different playing modes, power the soundbar on or off. On the back side, you have different kinds of ports (subwoofer, analog, digital as well as two HDMI ports). The soundbar is self-powered and no matter what kind of connection you choose, it will be quickly established. It also supports HDCP 2.2 (you can use it with 4K video source) and CEC. The great thing is that the soundbar fits nicely in any kind of house/apartment and it can be put in front or below TV but you can also mount it to the wall. The sound YAS-107 delivers is very nice. The mids and the highs are clear, detailed and the soundbar can get pretty loud. You can switch between bass extension, clear voice, stereo and surround modes depending on the situation or your preferences. The “clear voice” and “stereo” modes work best. We have to notice that the sound is surprisingly natural and detailed, which we didn’t expect from this kind of soundbar. YAS-107 offers virtual surround sound mode but you have to be aware that it is nothing near true surround sound effect, so don’t expect too much. Also, be careful with Bluetooth. 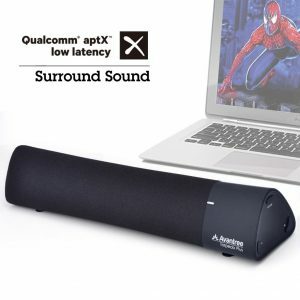 The soundbar doesn’t have aptX low latency codec and it is not good for watching movies, only for listening to music. 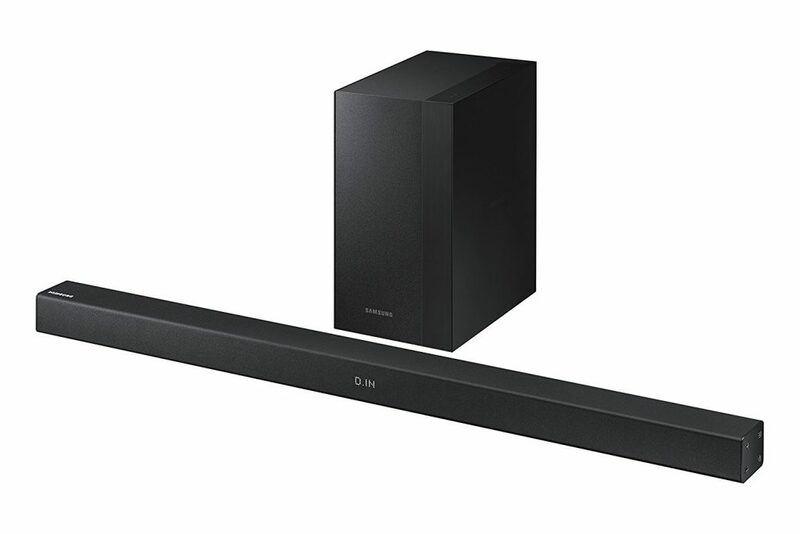 Samsung HW-M360/ZA is 2.1 soundbar and subwoofer set that you can get for not too much money. Its dimensions are 35.7×11.8×13.9 incher (subwoofer dimensions 7×2.8×2.1 inches) while it weighs approximately 10 pounds (subwoofer’s weight 3.3 pounds). The soundbar comes with digital optical, audio and USB ports and you can also use Bluetooth to connect it to all your Bluetooth enabled devices. You can put the soundbar below the TV on some shelf or mount it to a wall. The total output power is 200W (the subwoofer’s output power is 130W). The soundbar supports Dolby Digital and DTS features as well as wireless connecting to Samsung TVs. 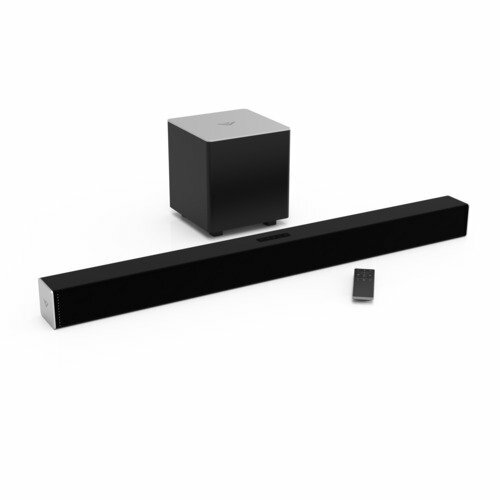 The soundbar and the subwoofer come in the oddly shaped box with their own remote and the necessary batteries, wall mount kit, power cables, optical cable and user manual. The soundbar comes in black color and it has simplistic design so it is easy to pair the set with any kind of furniture. The soundbar and the subwoofer are mostly covered with acoustic fabric while some parts are made from brushed aluminum. On the front side of the bar, you will see small panel display where you will get the information about the current mode of the bar or the volume level. Some customers claim the soundbar isn’t very loud but we didn’t have those problems; the soundbar was even louder than we expected. On the subwoofer, you have power input on the back and the power and wireless LED indicator that shine blue when the subwoofer is on and connected to the soundbar. The setup is very easy and fast and it gets even easier in case you have Samsung TV. The soundbar can be controlled not only via its own remote, but also via TV’s remote or Samsung Audio Remote App that you can easily install on your phone. The soundbar and the subwoofer offer quite clear and powerful sound, with very distinctive mids, lows and highs, clear vocals and nice bass. If you buy this product, Samsung allows you upgrade to the 4.1 channel system if you buy SWA-8500S wireless surround kit that offers even better surround sound experience. Samsung HW-M360 doesn’t have aptX low latency codec so it is not advisable to watch movies on your TV while the soundbar is connected to it via Bluetooth. It is more advisable to use Bluetooth for listening to music. The soundbar doesn’t have any control buttons and you always have to use the remote or phone app. 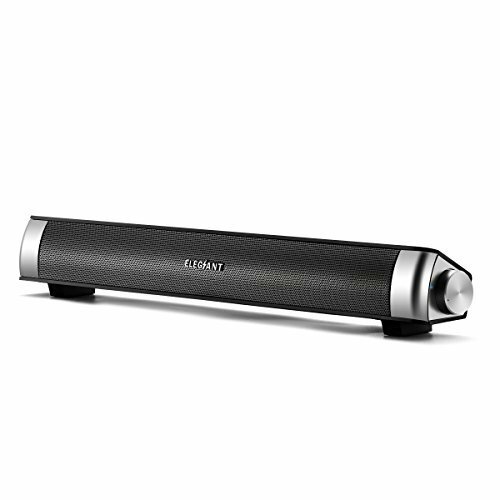 Elegiant is USB powered relatively small and quite affordable stereo soundbar. Its dimensions are 15.8×2.2×2.4 inches while the total output power goes up to 10W. It weighs 32 pounds and it has two drivers. It is wired and it comes with non-detachable USB and audio cables. The soundbar comes in a rather simple cardboard box with USB power cable, audio input cable and microphone audio cable. There is also one user manual. Elegiant USB powered soundbar can be described as cheap desktop soundbar. It is quite small and relatively light and portable. It comes in black/silver combination and it looks quite good. The soundbar feels well built and durable. Thanks to its design, you can put it anywhere you want and it will look stylish. You can connect it to your TV (in case it has 3.5mm audio port) or any kind of devices with USB ports. 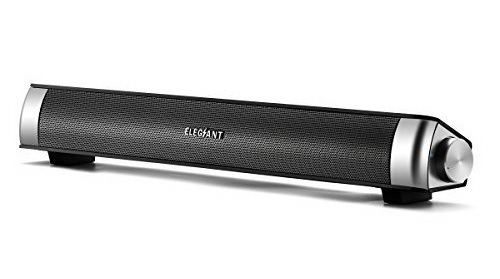 Elegiant soundbar has small anti-slip feet and it will be stable on any surface. The round button on the right side of the soundbar is used to control the volume by rotating it to the left/right side and it is easy to use. You can connect headphones to the soundbar, but they should have separate connectors for the mic and the headphones. The sound is more powerful than you would expect from such a cheap soundbar. The mids and the highs sound clear and distinctive and we really enjoyed our listening. First of all, you have to be aware that this is not Bluetooth soundbar and it also can’t be connected to TV with digital optical or HDMI cable. Second of all, the speakers are directional, so don’t expect any kind of surround sound effect. Also, on higher volumes, you can notice some kind of hollowness in the sound. Besides, it lack bass. The soundbar doesn’t come with remote, so you’ll have to adjust the volume using the rounded button. There is no on/off button and if you want to turn the soundbar off, you’ll have to unplug it. It also doesn’t have front panel display. 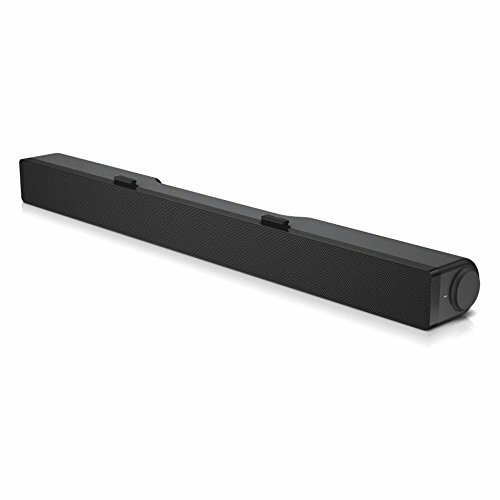 SB3820-C6 is the affordable soundbar by Visio. Its dimensions are 38x3x3 inches and it has two full-range 3-inch speakers and built-in bass modules (passive radiators). Dolby Digital decoder is built in the soundbar and it also supports DTS TruSurround. The soundbar can be connected to your devices via Bluetooth, optical and coaxial cables, but it also has 3.5mm and USB ports as well as one separate subwoofer output. The soundbar weighs a bit less than 6 pounds and its output level is 100 dB. SB3820-C6 comes with its remote, 2 AAA batteries, coaxial audio cable, stereo RCA 3.5mm cable, digital optical cable, power cable, user manual and wall-mount kit. 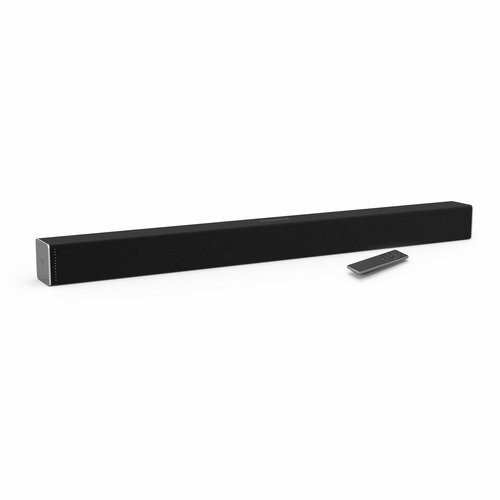 Vizio SB3820-C6 soundbar has very attractive design. It comes in black color and it is mostly covered with black acoustic fabric while the silver panels on the sides are made from aluminum. On the left side, you have LED indicators of pairing status or volume level. In the middle, you will see the set of buttons that you can use if you can’t reach the remote (power, source, Bluetooth buttons and volume controls). We really love the flexibility of the soundbar. You can place it anywhere: below the TV or computer or mount it to the wall. The manufacturer sends you the instruction how to mount it. It is a piece of paper with the real size of the bar. You just press it to the wall and drill the holes on the marked spots. The soundbar also offers numerous ways of connection and even Bluetooth works nicely. Sound quality is more than good considering the price. The soundbar can be quite loud and the mids and the highs are very pleasant, natural and clear. The voices are clear and distinctive, so the bar is great for watching movies. In case you don’t want to buy subwoofer, the built-in radiators will help a lot and produce decent bass. SB3820-C6 doesn’t have aptX low latency codec, so we wouldn’t advise watching movies in Bluetooth mode. In addition, we have to notice that some customers won’t like the low frequency tones, so if you really love bass, you better get a subwoofer. Polk N1 is some kind of retro-looking soundbar that tries to mimic surround sound effect. It tries to attract the customers by adding gaming modes on the list of the usual soundbar modes and it costs more than many other soundbars on our list. Its dimensions are 10x6x5 inches and it weighs 12 pounds. It has optical, coaxial and aux ports but it also supports Bluetooth 4.2 with aptX crs codec for CD audio quality. The soundbar has 4 different modes: two gaming modes (Halo and Forza) and two regular modes (movie and music). In addition, it has its own legs and it can stand on a shelf or be mounted to a wall. 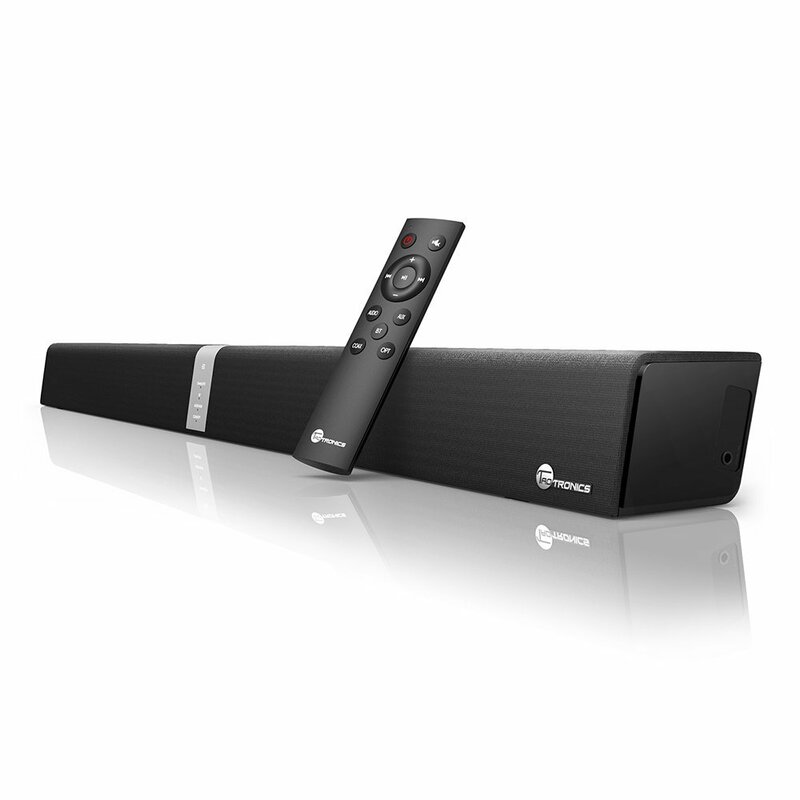 The soundbar comes with its own remote control, 6’ digital optical cable, user manual and 24V power cable. Polk N1 is one of the priciest soundbars on the list but we notice the difference between it and the rest of the soundbars. It has unique design and it comes in black and white colors with wooden elements. The soundbar is pretty heavy but very stable and well-built. On the front side, you will see the set of control buttons (power, learn, source, Bluetooth and volume controls). Below them, there are LED indicators that inform you about the volume level, the blue light shows which mode the soundbar is currently in while the red light will show up when you’re switching between modes. N1 has 4 speakers and it has bass regulators that are there to deliver as much bass as possible and create the effect of the true surround sound system. They do sound quite good. In spite of being advertised as the gaming soundbar with gaming equalizer, this soundbar acts well with movies and music too. N1 can stand below TV or be mounted to a wall. It supports differenty types of connection and it performs well in all situations. The bar can be controlled by its remote or by pressing the buttons on the bar itself. Also, if you press the “learn” button, you will be able to program your TV’s remote to control the bar. This soundbar performs quite well. As you could assume, it is very loud and the sound is very clear, crisp and balanced. First of all, we would like to mention aptX codec. It is important to tell that it is not low latency codec, which means it is still not advisable to watch movies when the soundbar is in Bluetooth mode. Second of all, the remote is very small and plasticky, and considering the soundbar’s price, the remote could be differently made. Also, some of the modes aren’t necessary. The Halo and Movie modes are some kind of surround modes while the Forza and Music are basically stereo modes. True surround sound can’t be heard from these products and we think the gaming modes are there mostly to attract more customers. In addition, the soundbar can be mounted to a wall and it comes with some holes on the back side, but you won’t get the necessary equipment and screws in the package. The ports are badly positioned, which can lead to unwanted disconnecting or damaging the cables. 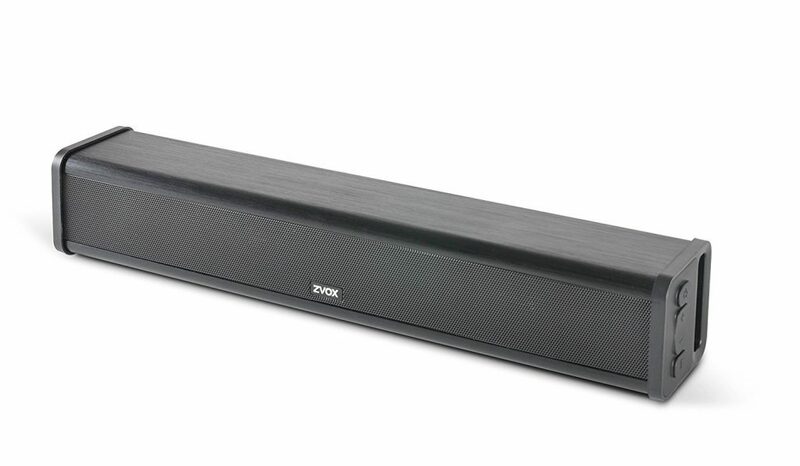 Pyle PSBV200BT is very interesting soundbar that doesn’t even cost a fortune. Its dimensions are 23.8×9.8×4.7 inches and it weighs 15 pounds. It offers Bluetooth audio streaming and it has built in FM radio with up to 30 stations as well as USB/SD card slots. The soundbar can be connected to any Bluetooth enabled device in your house (it uses Bluetooth 3.1V), but it also has three stereo RCA inputs as well as one 3.5mm input. PSBV200BT has one 5.25-inch woofer, two 1-inch tweeters, and two 3-inch full-range speakers. It has built-in sound amp as well as EQ audio configuration and all you do will be shown on small blue LCD front display. Soundbar’s total power output is up to 300W. The soundbar comes with its own remote and all the necessary batteries, user manual, 3.5mm audio cable and the power cable. Pyle PSBV200BT soundbar is quite an exceptional product that offers many ways of listening to music and watching video content. It has quite powerful speakers and it can be controlled by its own remote, by pressing the buttons on the soundbar itself (most of the buttons have double functions and the secondary options are activated by pressing and holding the buttons) or by using your TV’s remote. PSBV200BT can be connected to any of your devices wirelessly or wirily and it performs quite well in all modes. The sound quality you get from this device is amazing, at least when the bass is concerned. The soundbar is extremely loud and it delivers amazing low frequency tones, so if you don’t want subwoofer and you love bass, this is the right thing for you. 3D feature is great for movies and you can also control the level of bass. Electronical and hip-hop music will sound great as well as movie scenes with a lot of car engine noise or explosions. Pyle PSBV200BT doesn’t have aptX low latency codec and we wouldn’t recommend watching movies in Bluetooth mode. Also, the mids and the highs lack detail and depth. Besides that, you don’t have HDMI or digital optical port and the Bluetooth version is a bit old. The soundbar is quite large and the design is not too attractive. It can’t be mounted to the wall and the only way you can use it is to put it on a shelf under the TV or PC. One more Vizio product is on our list of 13 best soundbars under $200. It’s called SB3821-C6 and its dimensions are 38x3x3 inches. The sound bar weighs 5.8 pounds and it has two 2.75-inch speakers while the subwoofer has 5-inch spaker. The subwoofer is separated from the bar and it is connected wirelessly to the bar. Both soundbar and the subwoofer are self-powered. SB3821-C6 can get quite loud as it delivers maximum 100 dB of sound with less than 1% of THD. It has built-in Dolby digital, DTS TruSound, and TruVolume that allow you to get full-sound experience and avoid problems with the changes in the sound of TV program and commercials, for example. The bar can be placed below TV or mounted to the wall, while the subwoofer has great range (up to 50-55 feet) and it can be placed anywhere in the room. The bar has one two RCA inputs, 3.5mm analog audio input, digital optical port, USB port and built-in Bluetooth. The soundbar and the subwoofer come with their own remote and adequate batteries, RCA to 3.5mm stereo audio cable, digital coaxial cable, optical digital cable, power cable, user manual and wall mounts. They also send you the wall mount template. SB3821-C6 has very slick design. It comes in black color with brushed aluminum part on the sides or on the top of the subwoofer. The rest of the device is covered with acoustic fabric and it can be easily fitted into any room/space. The bar can be placed below TV or mounted to the wall, while the subwoofer has great range (up to 50-55 feet) and it can be placed anywhere in the room. On the bar, you will find LED indicators on the left side that will inform you about volume changes, pairing etc. On the top of it, you will see the set of control buttons (power button, source and Bluetooth button as well as volume controls). You can also control the bar with its remote or simply use your TV’s remote. The sound that this set delivers is more than great. It is usually used with larger TVs (42-inch TVs and larger). It gets quite loud, the mids and the highs are clear and distinctive, the dialogs are highly understandable (event the whisper can be easily heard) while the subwoofer adds a lot of powerful bass. The one flaw we could notice is the lack of aptX low latency codec that would allow you to watch video content via Bluetooth without any delay. Dell AC511 is quite small and quite cheap Dell soundbar meant mostly for PC. Its dimensions are 16×1.5×1.9 inches while it weighs approximately 16 ounces. It has total power output of 2.5W and it is connected to the power source via USB cable. Frequency response of the soundbar goes from 100 to 20000 Hz. It has integrated T-hooks that allow it to be attached to the bottom of the compatible Dell monitors. The soundbar comes alone with standard non-detachable power USB cable. Dell AC511 is very small and lightweight soundbar that will definitely satisfy your basic needs for the better sound quality and greater loudness than your computer or even TV can deliver. The soundbar is nicely designed and built and it is very simple. On the left side, you will find round button that is actually volume button, while two ports are on the right side. In one of them you can plug in your phone or any other device with 3.5mm audio cable and in the other one, you insert your headphones in case you want to listen to something in private. The soundbar is simply attached to some of the Dell monitors. You just have to insert the hooks into the holes and slide to the right side. The soundbar will stay attached to your monitor and it will be hardly noticeable. The important thing to know is that the USB cable has to be inserted into the USB port on your computer, not monitor. The sound quality is good for the price and the bar is loud enough. It is a quick cheap solution for small rooms and it works nicely. The soundbar doesn’t have front display nor the remote so you will have to control the volume on your device or use the round button. The manufacturer changed the length of the USB cable from 55cm to only 20cm, which may be a bit short for some users. TaoTronics TT-SK016 is relatively affordable soundbar usually used as the inexpensive replacement for home theater speakers. Its dimensions are 36.2×2.1×2.8 inches and it weighs less than 4 pounds. You can connect it to your devices via aux or optical cable or you can pair it to your phone via Bluetooth with 33ft signal range. The soundbar can be placed on a shelf below TV or mounted to a wall and you can control it using its remote or using the buttons on the bar itself. It has 4 10W speakers; 2 full-range and 2 mid-low frequency speakers that are there to replace true subwoofers. The soundbar comes with its own remote control, one optical, one power and one 3.5mm to RCA cable as well as user manual. TT-SK016 is well-designed soundbar. It is lightweight, slim and the mesh is made from some kind of aluminum. The bar comes in silver color and on the front side, you will see only different kinds of lights (red light when the bar is off, blue light for Bluetooth, green for aux mode and yellow for optical mode). On the top, you will see Bluetooth, source and power buttons as well as volume controls. On the back, there are all the necessary ports and the holes that you will use if you want to mount the soundbar to your wall. On the bottom, you will find three anti-slip pads that the bar stands on if you place it under your TV on some shelf. The sound quality is more than good for the price. The soundbar delivers balanced sound; the highs and the mids are good, crisp and distinctive. The lows are clear and they offer good amount of bass. The Bluetooth connection works nicely and the sound quality remains satisfying in Bluetooth mode. First of all, this soundbar doesn’t have HDMI ports. Second of all, it doesn’t have aptX low latency codec so it is not advisable to watch movies in Bluetooth mode. You should use Bluetooth only for listening to music when the bar is connected to your phone or some other Bluetooth enabled device. Also, the soundbar doesn’t have real subwoofers so don’t expect mind-blowing bass coming out from these speakers. Samsung HW-J250 is one of the expensive soundbars on our list with simple design, relatively small dimensions (28.3x3x2.6 inches) and 4 pounds of weight. The soundbar can stand below your TV or be mounted to a wall. It has optical, USB and aux ports so there are many ways to connect it to TV, phone, computer or some other device. Bluetooth is also one of the options. HW-J250 has two speakers and two woofers and the four speakers have total output power of 80W. You can control the soundbar via control buttons on the bar, via its remote or Samsung Audio Remote App on your phone or tablet. The soundbar comes with its own remote and adequate batteries (2 AA), user manual, optical cable, USB cable and wall mount kit and special screws. HW-J250 is nicely designed soundbar made from plastic and acoustic fabric that covers the speakers and the woofers. It can be easily fit in any house or room, placed on a shelf, in front of the TV or mounted to a wall. On the top of the soundbar, you have power and source buttons as well as volume controls. You can also use phone app or remote to control the bar. When you change the mode or the source, different lights will show up on the right top end of the bar. The white color of the “source” LED light stands for D.IN mode, red indicates aux mode while green indicates TV sound connect mode. When the “mode” LED light turns red, it means the voice mode is on, when it changes to green, you will know the sports mode is on, while white light stands for 3D sound plus mode. Bluetooth and USB modes have their own LED indicators. Apart from stylish design, this soundbar sounds quite good and it offers different kinds of connection to different devices. There are many ways to control it and it can occupy many positions in your home. The Bluetooth works nicely and the sound in general is relatively loud, clear and crisp. It sounds way better than regular TV speakers and it makes the dialogues completely understandable. HW-J250 doesn’t have front panel display, so you will never know the exact volume level. There is only one red light on the front side of the bar that is indicating that some settings are being adjusted. The soundbar doesn’t have aptX low latency codec and it might be complicated to watch movies when the bar is in Bluetooth mode. Although it offers different sound modes, we really couldn’t notice bigger difference between them. Besides, the bass is not so powerful in spite of the built-in woofers. Home theater systems are very complicated and they consist of many different kinds of speakers that you have to put in the right place in order to get the best possible sound quality while some of those speakers have to be mounted to the walls in the room where your TV is. It can be quite complicated to set them up in the right way. Soundbar is the synonym for “easy” and “simple”. These products have one or two parts at max and their mounting doesn’t require special skills as the only important thing is to put the bar below or above your TV in order to avoid blocking the signal from TV remote. As we have mentioned in the text above, subwoofers can be placed anywhere. You won’t notice any difference between the sound that produces the subwoofer on the left or on the right side of the TV. Soundbars are not only easily set up; they are also easy to use and connect to your device. They usually have less cables than home theater systems and they can even be connected to your device via Bluetooth or Wi-Fi, as most of the modern soundbars are Bluetooth enabled. Besides, if they don’t have built-in adapter, you can buy one separately. We must agree that soundbars don’t deliver the bests sound in the world. They have some flaws, but they are definitely much better than regular TV speakers (no matter how modern and good your TV is) and some of them can sound even better than some regular speakers. Are you familiar with the situation when you’re watching an interesting movie on the TV and then the time for commercials comes? We are sure you have experienced that. The commercials are always louder than the rest of the program and you can do nothing about that. However, the soundbar can make great difference because it can control volume level better than regular TV speakers can so the commercial won’t scare and annoy you any more with their loudness. You will be able to watch both the movie and the commercials without changing volume level when the commercials start and again when the movie continues. The truth is they can also be expensive and cost over $1000 just like home theater systems. However, when the soundbars are concerned, there are always many great models that can be bought for small or relatively affordable amount of money. Our list of 13 best soundbars under $200 confirms that statement. If you go through the list carefully, you will see that only several soundbars have high prices while the others are cheap or quite affordable but all of them offer so much for the money. They may not be big and evenly distributed all over your room, but they look quite stylish as they aren’t very bulky and can look very nice if they are nicely matched with the color or the model of your TV and furniture. They definitely make the space look more equipped and modern. No matter how good your soundbar is (and there are some excellent soundbars on the market) it can never deliver so powerful, overwhelming and detailed sound as some big speakers or home theater systems. Those systems are meant for bigger houses with spacious rooms where the real acoustic pleasure can be achieved. Soundbars are sometimes advertised as “virtual surround sound” devices, but they don’t really offer the true surround sound effect. It is basically just some kind of better and wider stereo sound. Soundbars can never be compared to the home theater systems and they are more suitable for smaller apartments. We have said that soundbars are very simple, at least simpler than home theater systems but they have their secrets and we think you should know them if you want to get the best possible soundbar for you and your home, and also be prepared for everything that can cause you problems. The position of your soundbar should be planned even before you make the purchase and it should be defined based on your enterer and the position of your TV. If you have smaller TV (for example 32-inch TV) and you want to buy sound base, you know you will put it right under your TV or on a shelf under the TV. However, it gets a bit tricky when you’re trying to fit your regular soundbar in your room. The bar seems thin and you would think that you can put it anywhere, but it can actually cause problems if you put it in front of your TV as it will block the signal from TV’s remote and you will have to stand up or move to the left or to the right to switch between channels. If you want to avoid those problems and enjoy your TV and soundbar completely, put the soundbar below your TV or mount it to the wall below the TV. In case you have the subwoofer, you can put it next to the TV or even on the floor. That way, the soundbar won’t cause any problems and the sound will still be great. This depends on your preferences but we really think it is convenient and practical to have front panel display on the soundbar. If your soundbar doesn’t have one, you will never know how loud it is and you will maybe try to turn the volume up because you are not aware that it is already turned up to the maximum. When the soundbar has that display, you will see all the necessary information right there and you will know the exact volume level any time you press the button. Many soundbars come with their own remote. It is not some big problem if they don’t because you can always program the soundbar to accept and react to the controls of the TV’s remote. However, not all people want to deal with it, as you will have to disable TV speakers in order to receive the sound only from the soundbar. After that, when you try to turn up the volume on the soundbar, your TV will also receive those commands and report error message all over your screen to inform you that the it is unable to perform the action. It is nothing very serious, but it can get quite annoying. Modern soundbars usually have two very simple ways of connecting to TV. One way is via digital optical cable while the other is via HDMI cable. If you choose to use HDMI cable, you have to insert one end in the HDMI port on the soundbar and the other end in the HDMI port on your TV. The TV should show TV ARC in the display and the sound will be delivered through the soundbar. In case the message doesn’t appear, you will have to switch to D.IN mode (after pressing the Source button on the soundbar). If you choose to use digital optical cable, you will do it the same way like you would do with the HDMI cable. The only difference is that you will have to press the Source button on the soundbar immediately after connecting and choose D.IN. Of course, there is always the option to connect the soundbar and TV via Bluetooth (in case your TV is Bluetooth enabled or you have Bluetooth adapter). The process should be quite simple. You press the Source button and Bluetooth will appear on display. After that pairing will begin. Once the devices are paired, the status will be written on the soundbar display. When you’re buying soundbar, one of the most important things is to analyze carefully the dimensions of the available soundbars as well as the dimensions of your TV. One thing you should be aware of is that diagonal of the TV is not important; the length of the TV is what matters, especially if you want to buy sound base. Also, pay attention to the dimensions of the furniture below or around your TV and try to figure out if the potential soundbar can fit in nicely. At the end of the article, we would like to say that we have tried to present those 13 models in the best possible way and make the decision about buying soundbar as easy as possible for you. If you go through our list of 13 best soundbars under $200, you will definitely find affordable products with many great characteristics that can offer many happy hours in front of your TV. Can I connect Polk N1 with my iPad Air 3? Yes, you can pair them via Bluetooth and stream music from your iPad Air 3.